Food Truck: Noble House Hawaiian Plate Lunch Review – Wichita By E.B. 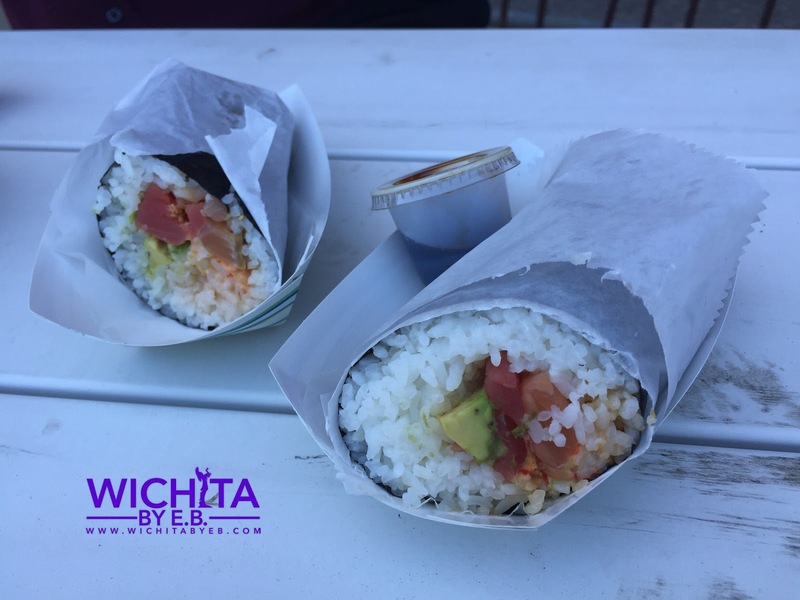 My fifth stop on the 2016 Wichita Food Truck Tours brought me back to the Via Christi parking lot where another hotly anticipated truck was set up at. 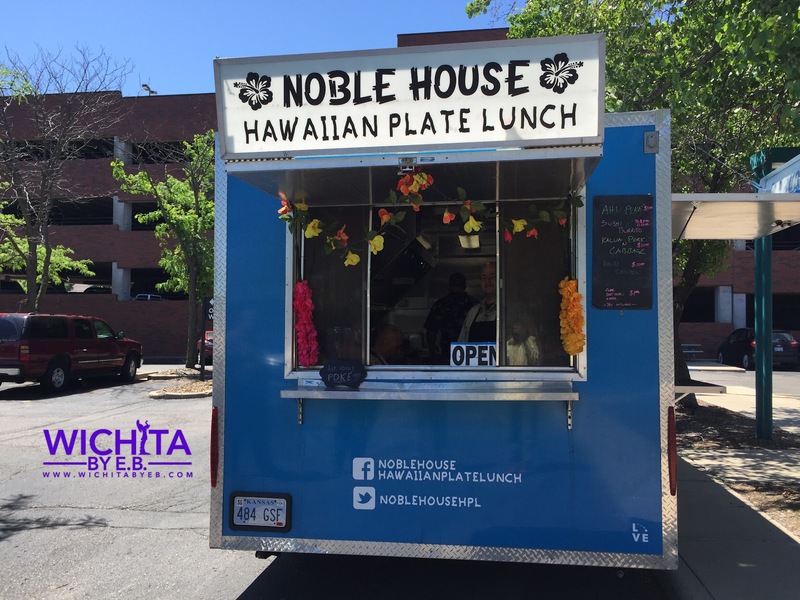 It was Noble House Hawaiian Plate Lunch which to nobody’s surprise serves Hawaiian Food. 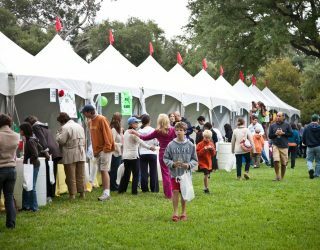 You can follow them on their Facebook Page to see where they will be posted up at throughout the week. Some Shocker fans may be familiar with them as they had their own set up at Shocker basketball games at Charles Koch Arena serving their unique meals to the best fans in the Nation. When I noticed they were close to work, I immediately knew this would be my next stop on the Food Truck Tour. 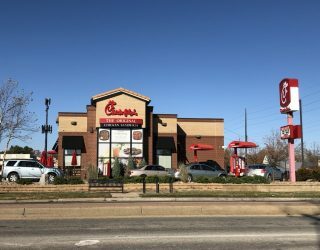 Three colleagues and I made the drive to Via Christi and got excited when we looked at the menu. We got there early enough to where there was no line. It gave us time to chat up the guys inside the truck who showed us examples of everything on the menu and gave us suggestions on what to try. Have you ever met someone and you thought to yourself, “Man, those guys were just really cool and chill.” That’s the vibe we got from the Noble House guys. They were so friendly, chill, composed and friendly. Between the four of us, I got the Ahi Poke’ along with half a Sushi Burrito. 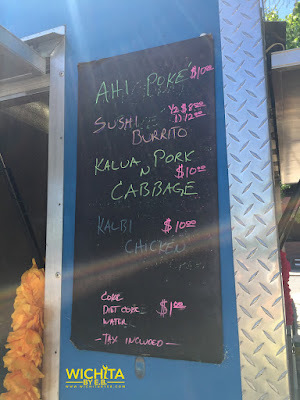 Two co-workers had the Kalua Pork with a half Sushi Burrito and a third got the Kalbi Chicken. We were served right then and there, found a park bench and dug right in. Take a look at this goodness. The Sushi Burritos were loved by all. One guy in our group had never had sushi before because of his concern for raw fish but really liked his first bite. The sushi burritos were packed with tuna, lobster, avocado, rice and other fillings. They were as excellent. One guy mentioned he had some issues with the seaweed paper but overall the flavor was spot on. 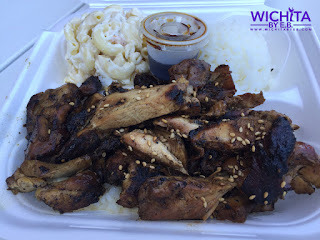 The Kalbi Chicken and Kalua Pork were those types of meals where you would take a bite, pause, take it in, smile and repeat the process. I was watching my co-workers continue to eat in a not-so-creepy way. 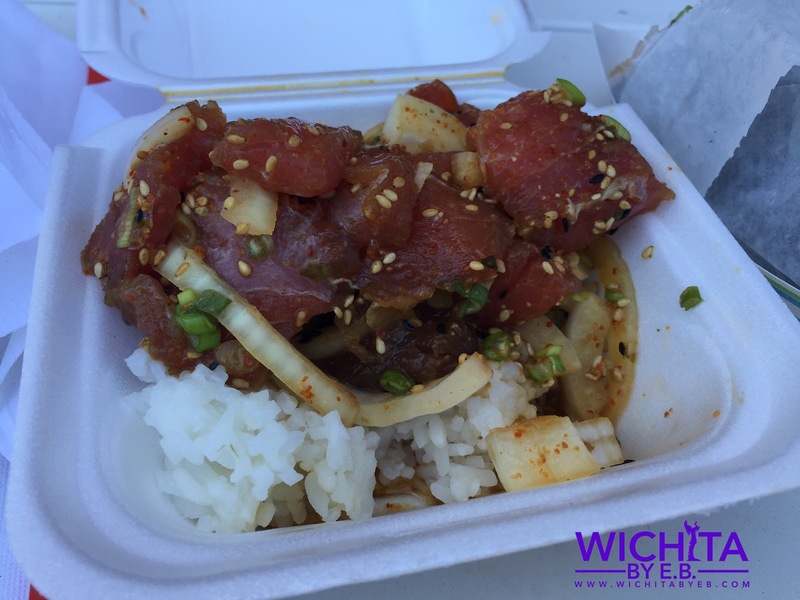 They offered a couple bites and I kind of wished I had ordered the chicken or pork…..
……..that is until I started on my Ahi Poke’. This consisted of nice, large chunks of tuna over a bed of rice and small bits of lobster. GOOD GOD! The one thing about tuna is making sure it’s all high quality stuff. Noble House spared no expense. This was the most delicious thing I have eaten in quite a while. 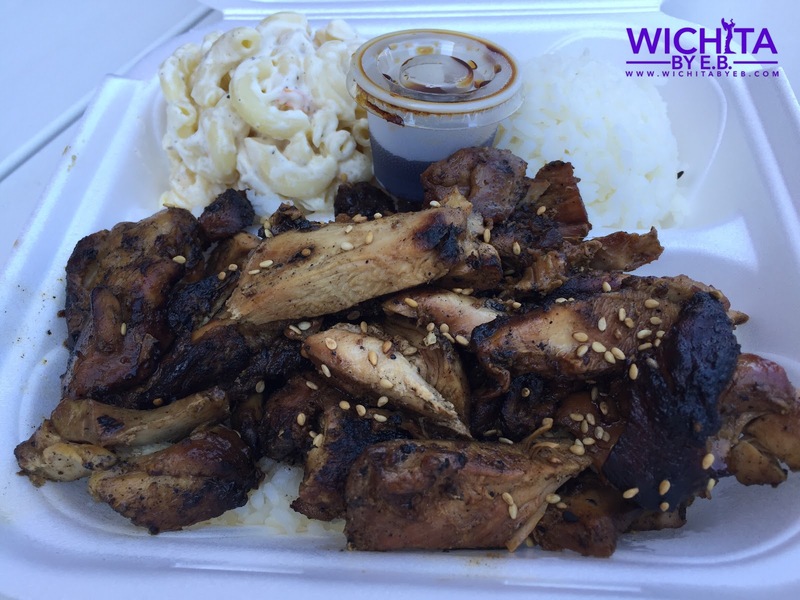 If I’m ever on Death Row (knock on wood that I’m not), this might be my choice for my last meal……that and a McRib sandwich from McDonalds……and a bowl of Pho. By the end, everyone was full. While a slightly higher price than some other food trucks, sometimes really good food has a price to it and we felt it was worth it. 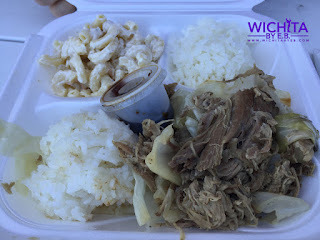 Everybody shared the same sentiment this was the best Food Truck we’ve been on on this Food Truck Tour. 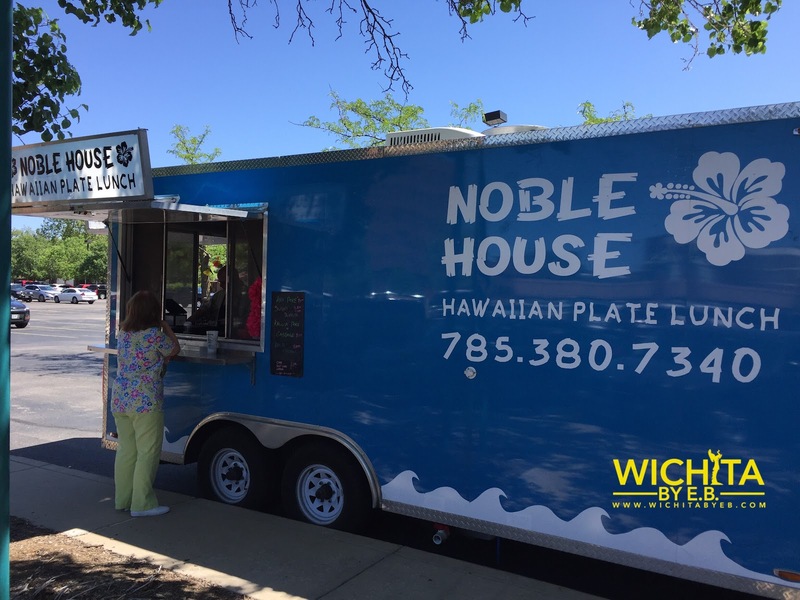 The bar has been set by Noble House.